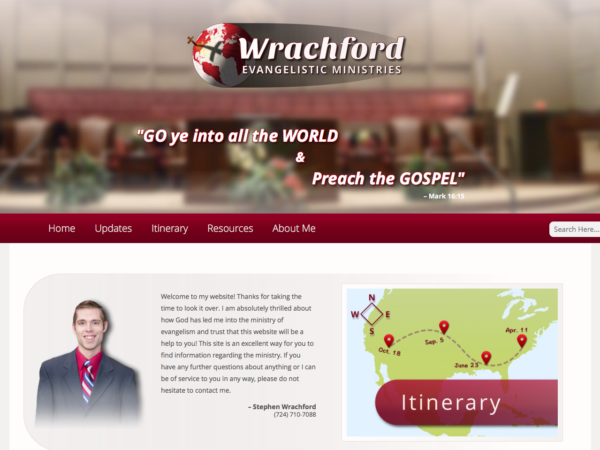 This site represents Stephen Wrachford and his evangelistic ministry. In summary, the project included a custom logo, branding, website, automatic social posting, and an automated newsletter mailing system. The website works well on both desktop and mobile devices and presents itself with a modern, attractive appearance. Stephen needed a website that made it easy to manage regular ministry updates and itinerary scheduling. The system efficiently manages his itinerary information and automatically distributes his latest ministry news to his subscribers.